It should come as no surprise that the owners of Aedes de Venustas, Robert Gerstner and Karl Bradl, both hail from the land that gave us the Asam brothers and Ludwig II. No one did Rococo -- a mid-18th century style that’s all about curves, trompe-l’oeil, playfulness and general, glorious, Catholic over-the-top-ness – better than the Bavarians. 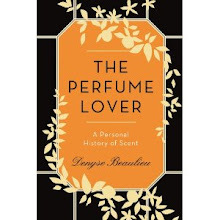 Thus, the holy shrine of New York perfume aficionados is a lush cross of the Rococo and the Romantic; a wormhole tunneling back from the West Village into Lola Montès’s boudoir. But though the boutique’s aesthetics is reprised in the packaging of the Aedes perfume brand, the scents themselves are made of sterner stuff. Bertrand Duchaufour’s rhubarb-skewered cloud of incense in Aedes de Venustas Eau de Parfum managed to feel both archaic and dementedly modern – he called it his “crazy accord”. Ralf Schwieger’s Iris Nazarena, while seemingly more subdued, inhabits the same time-warp. Considering its muse, the scent could have been called Iris Gris. But for Ralf Schwieger, the first hurdle was steering clear of the N°19 template: he clears it by using a different type of greenness: star anise spans the spectrum from day-glo green to burnt umber liquorish. Ambrette shoots its limpid, iced-vodka light into the blend. Schwieger has worked in layers of pastel and charcoal strokes, the iris’s powdery texture blurring into a haze of incense over a petal-thin suede base. The effect is a texture both delicate and tough, flecked with the burnt smells of clove and oud, rooted in earth and flint. There is already a consistency to Bradl and Gerstner’s olfactive choices, not only because incense is the thread that will run through the collection, but also because the way notes are put forward in bold, wide strokes seems to express a house style. It’ll be interesting to see whether their projects with other perfumers display that same consistency. But it seems that Aedes de Venustas is shaping up to be a real voice in niche perfumery. Aedes de Venustas have kindly offered five samples for my readers. Just drop a comment to participate. Hello Denyse, so glad to see your reviews back! Looking forward to reading more, but I do realise that promotion of your book is really time consuming! New Aedes sounds really interesting and also been curious about new Bertrand's trio for L'Artisan, have you tested it already? Hi Ela! It's more the combination of PR and an insane amount of work that's doing me in... I did test the new trio but since it's not due out until fall, I'm waiting a bit for the reviews. And, yes, the new Aedes is really good. Hi, Denyse. 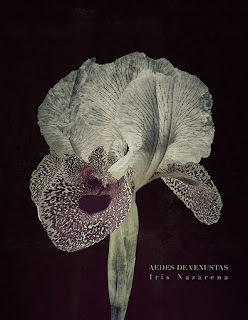 I'm looking forward to the Iris Nazarena and have high hopes, given your beautiful description. Please enter me in the draw. I liked the idea of the rhubarb one, and found it intriguing on paper, but in real life wear, found it almost overwhelming with that crazy nuclear green accord. This iris sounds very interesting. I tried the Aedes rhubarb; I enjoyed the green sharpness on fabric but it was too much to wear. I love Iris Silver Mist and sometimes enjoy H'Iris. SL's Bas de Soie is one of my favorites. So I'd love to try this! I really like the older brother of Iris Nazarena. The new fragrance sounds interesting (great bottle and inspiration); as I read through your lines the image of an iris flower morphing into an orchid morphing into a hungry insect haunted me. Scary and fascinating. That said, I am not generally drawn to iris perfumes - they are fascinating; in turn meditative, earthy, powdery or even severe and austere. All adjectives that do not fit me. Could IN be the "different" iris that befriends me? Bradamante, the last time I was in Bavaria, it was to go and interview an old princess in her castle, but I've never had the time to visit that palace... Tiepolo, what's not to love indeed? Michael, I agree the rhubarb is not for the fainthearted. That's what I loved about it, but I can't say I'd reach for it daily. The iris, though very original, makes for a more comfortable wear -- in fact when I was in New York in March, the preview sample was my go-to fragrance. Jarvis, "nuclear accord" is a good description for the rhubarb. When I was developing Séville à l'aube, it was so strong it chased us out of the lab more than once. As I said above, Iris Nazarena is a bit easier to pull off. Nicola, aren't those prints gorgeous? I've actually just learned that they are the work of Karl Bradl, who art-directed the scent -- gifted gentleman, Karl! Marla, if you love all of those, Iris Nazarena will certainly interest you. I find it more comfortable that the haughty marquise that is Bas de Soie. Zazie, I think you'll find Iris Nazarena is also a meditative fragrance. As you know, that doesn't necessarily fit me either as an adjective, but the fragrance does. As for the flower that inspired it, I do find it's a particularly haunting variety of iris. Nice to have you back! 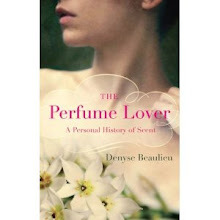 The fragrance seems interesting, judging from your beautiful as ever prose... the picture too, very evocative. I'd love to try it! Iodine, I really love that picture too... Nice to be back, though how I'll manage to stay in the coming weeks I'm sure I don't know! Janice, as I've said above, Iris Nazarena is something I really enjoy wearing. It's not as foreboding as Iris Silver Mist, and not as blindingly bright as Infusion d'Iris. I'm very anxious to try this, thanks for the review and the draw! I have a hit and miss relationship with Schwieger's perfumes (at least with the ones I've tried), most of them are "fuzzy and buzzy" in a way that bugs me, but there are also gems like (co-authored) Eau des Merveilles. This iris sounds wonderful and the grey bottle is striking! Also looking forward to sampling his violet-leather (or something like that) for Atelier Cologne that came out recently. Mikael, I guess that means Ralf S. has a distinctive style, even if it doesn't always play nice with you! I am crazy about BD's Aedes EDP. It's risen into my top 10 (or maybe 20) fragrances. I'm a BD fangirl. Love what he's been doing lately. Really curious about this one from Ralf, and would love to try it! Please enter me in the draw. Thanks, Denyse! Karin, that's the thing about fragrances with strong character, isn't it? When you love them, you're crazy about them. I also loved the first Aedes scent, the combination of tart notes and incense smells really gorgeous. Dorothea, you certainly *are* an iris fiend! I don't doubt this will please you. The name is so evocative, I'd have given it a sniff just for that! I sooo much want to try Iris Nazarena. With a name like that, colour of the bottle and the ingredients it CAN'T be anything far from beautiful. Patricia, I confirm: it *is* beautiful. I love that smoky grey bottle as well... If memory serves, it's a pretty uncommon shade for a perfume bottle. Iris was the first perfume note that I fell really hard for, so it's always a pleasure to explore the note. I do tend to go for more cuddlier interpretations lately (Lumiere Blanche, Bois d'Iris from VC&A) but maybe this new scent will fit well too. Thank you for the draw! I have started on my second decant of the AdV-perfume and love both the rhubarb and incense in it. Since I have loved most iris fragrances I have tried so far, I would very much like to try this new perfume, with some unusual twists it seems. Miss K, among the cuddlier irises, I found Blanc de Courrèges to be quite lovely. Iris Nazarena isn't cuddly, but there's a warmth to it. Ingeborg, you should definitely try it. Anita: my pleasure! I agree iris is always a fascinating theme. Beautiful description. It is impossible to resist the urge to smell that wonder newborn. There is a lot of fascinating allure in all aspects of business strategy of tha brand, including the sensual and sophisticated image chosen for the launch. Thanks for the draw. Incense + iris sounds good to me! I really like (and own) the first AdV scent and this one also sounds like something I will like. Thanks for the opportunity to win a sample. I love interesting iris fragrances so please enter me in the draw. Susan, what's not to love, right? Filomena, it's very different from the first but definitely worth sampling. Aedes de Venustas is a slender pipe of 19th century opulence that should come with its own spirit animal. Very intrigued about these releases! womo531, it certainly seems to be generating a lot of interest! Sounds intriguing, love iris what could be better. Please enter me in the draw! You don't need to enter me in the draw. I just wanted to stop in and say hi. And to tell you how much I enjoyed the review. I was looking forward to this fragrance and now, I'm even more intrigued. Hi Melissa, so happy to see you drop by! And thank you. Great review and I'm intrigued. I love Ralph Schwieger's other creations and I have mixed feelings about No 19 so I would be most curious to smell this new creation. Please enter me into the draw. Sounds ancient and modern. What an unusual flower; a natural hybrid of orchid and iris? Such beauty. Jordan, the flower is not a hybrid, it grows naturally in Israel and Jordan. The orchid bit is purely drawn from my imagination! I'm fond of iris fragrances and would really love to try this- and the bottle looks gorgeous! Eva, it does, doesn't it? I love that smoky grey. The rhubarb in the first fragrance to me was a real winner...this looks like it could be very interesting as well. I look forward checking it out. Thanks for the draw Denyse. The Scented Hound, it is interesting indeed and I'm sure you'll find it worth your time (and skin real estate). Neither of the previos Aedes scents worked on me, but this one sounds far more promising. Looking forward to sniffing it! Hello...I loved Aedes' Rhubarb ode. But iris is my holy grail note. Really looking forward to trying this! Please enter me and thanks for the lovely review. I really, really wish to test this, too. Thanks for the generous draw! Lyubov, you're in good company -- so many iris lovers among with readers, and with good reason! I can't wait to smell this, thanks for letting us know where to find it in Paris, and thank you for the draw! Carla, I'm sure there will be many other retailers, but Jovoy is definitely a stop in any Paris perfume pilgrimage! I'm nw here and so glad to have a chance to participate in this draw. i have not done much exploration of Iris and looking forward to discovering something to love. Am I too late to participate? I find this spring (autumn more like it at the moment) iris perfumes are quite often the ones I decide to spray in the morning. Ines, I'm sorry to hear your spring has been as dismal as ours... Seems to be improving today though! And no, you're not too late. I love iris (in fact I am wearing Iris silver mist as I type this) and I am so intrigued by your review. It sounds like a wonderful scent, and i would love to have the chance to try it. Thanks for the draw! Tara, that's right, I'd forgotten that you don't take too kindly to cumin! Maren, if you love ISM I'm sure you'd be interested in this one.